High Wycombe & District Cage Bird Society would like to invite all would be and current bird keepers to the monthly meetings. There is the opportunity to discuss best practice in bird keeping and listen to outstanding speakers. First attendance is free of charge and annual subscription is £5 per year (Adults) Joint £10 Juniors are FREE- please join our body of members who place their birds first. :OUR HQ HAZLEMERE COMMUNITY CENTRE,ROSE AVE,HAZLEMERE,HIGH WYCOMBE HP15 7UB. 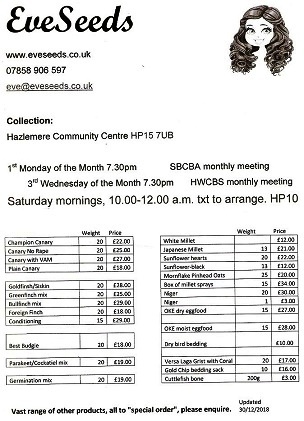 * Buy your Top Quaility Seed, Soft Food & Other Bird Bits from Eve at our meetings. * If you are looking for birds see our (Members Birds For Sale) page . * High Wycombe are Chiltern Champions for 2018. Check out our "links" page for specialist societies etc.